Han Kang, writer of The Vegetarian and Human Acts, has returned with a new book (translated by Deborah Smith), one very different from her first two works in English. 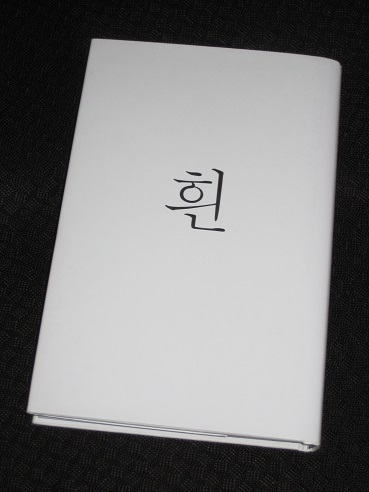 It’s a novel, even if it doesn’t always read like one, divided into three parts, each labelled in this English version with a number, an English title and the Korean original. We meet a writer using a stay in a wintry foreign city to create a new text and carefully examine some open wounds. Over a number of short sections, some a matter of lines long, the writer (as the title suggests) uses the idea of the colour white to… well, what exactly? She thought of certain incidents in her own country’s history, the country she had left in order to come here, of the dead that had been insufficiently mourned. Trying to imagine those souls being thus eulogised, in the very heart of the city streets, she realised that her country had never once done this properly. However, The White Book is really devoted to the writer’s dead elder sister, an elegy to the ‘Onni’ she never knew, granted just two hours of life before passing on. When the writer/narrator hears a story of a man haunted by the screams of his dead brother, she wonders if her sister is watching over her, too, realising that she will never hear her screams as the poor baby never made a sound in her time on earth. Her presence gradually becomes more prominent, with the second part told by an unknown ‘she’, later revealed to be the sister. The more the writer contemplates the departed in her life, the more the book works to make them appear. The city abounds with fog, the white in which the dead may be present, hidden from view, and a later piece recalls the white clothes Koreans traditionally burn for the dead, so they can wear them, wherever they happen to be. Yet the importance of white extends to the book itself as a physical object. 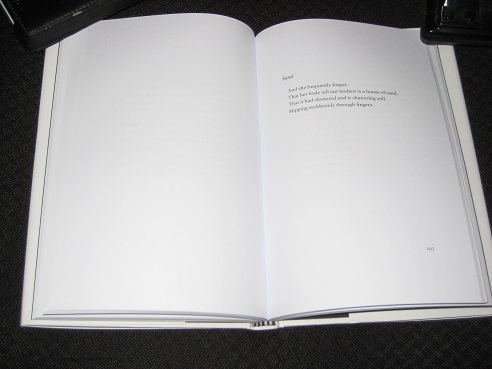 Many of the 160+pages are blank, framing the texts (some of them rather brief) in white. The hard covers are similarly colourless, and the occasional photos interspersed throughout the book (as you may have guessed, they’re not in colour) add to the sombre tone. In fact, there’s an overwhelming feeling of a world lacking in hues, with The White Book influencing the reader and pushing us to envision the scenes in black and white. There’s an interesting choice here in deciding not to translate this as ‘a person’ or ‘the person’, which would be more natural in English (those words are presumably absent in the Korean, a language without articles). It lends the sentence an air of directly addressing the ‘person’ (the ill-fated sister), which given the way the novel develops, is quite apt. Choices like these work with the writer’s own linguistic decisions (such as the Korean idiom ‘laughing whitely’) to make the reader slow down and reflect on the text. There are many stories contained within The White Book, but is there a story to the novel itself? Readers expecting a conventional novel may struggle, as it’s a book that requires the reader to trust in the writer, rewarding those who prize language and imagery over plot. The shift from the first part, a first-person ‘narrative’, to the second part, a third-person section that forms the bulk of the work, may confuse some readers as the narrative thread is seemingly broken. Only when we come to the close of the book do we see how and why the novel is structured in this way, realising how it all fits together. This life needed only one of us to live it. If you had lived beyond those first few hours, I would not be living now. My life means yours is impossible. Sadly, the dead cannot be brought back, but we can pay tribute to them. In doing so here, Han has created a story of what might have been, an echo of a life, vivid without the need for colour. Thanks for this thoughtful review – so much more useful than the waffly pieces that have appeared in some of the mainstream press. It almost inspires me to give the book another chance! Philip – Definitely worth it – you just have to accept it for what it is (which is definitely not a traditional novel, but a poetic, fragmented work). I have not seen this in the U.S. yet, but I will look for it. I’ve been a big fan of the first two novels to make it over here. I’m looking forward to more.